Philippine culinary history would not be complete without long chapters on the roles and contributions of generations of women from the Reyes family, beginning with Aling Asiang, founder of the iconic Aristocrat Restaurant. She set the standard for what Filipino dishes should taste like and elevated home cooking to restaurant standards. Her daughter Teresita laid the groundwork for a vast food industry that now enables Pinoys anywhere in the world to cook sinigang, kare-kare, and other Filipino dishes. Her Mama Sita mixes encouraged millions here and abroad to overcome intimidation, venture into the kitchen, and cook for their loved ones. Teresita’s daughter Clara established the Mama Sita Foundation which aims to preserve Filipino culinary traditions and heritage for present and future generations to appreciate and enjoy. 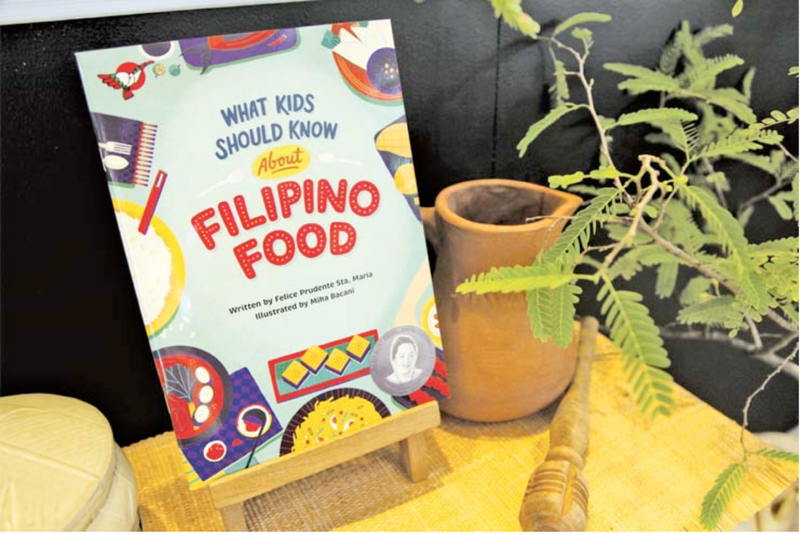 In celebration of Teresita “Mama Sita” Reyes’ 100th birth anniversary, the Mama Sita Foundation has collaborated with Adarna House in publishing the Special Mama Sita’s Centennial Edition of What Kids Should Know About Filipino Food. This new book by culinary historian Felice Prudente Sta. Maria is an informative food guide not just for kids, but for adults, too, and anyone who wants to know the littlest details with greatest importance on Philippine food and culture. Felice Sta. Maria, a celebrated author of various food books, including the award-winning The Governor-General’s Kitchen: Philippine Culinary Vignettes and Period Recipes and the Foods of Rizal, has been collecting historical materials regarding Philippine cuisine since the 1970s. The Mama Sita’s Centennial Edition highlights the life of Teresita Reyes and her contributions to Philippine food history. Teresita was born on May 11, 1917 in Manila to a family known for good cooking. Eighty years ago, her mother established the Aristocrat Restaurant, the first and perhaps one of the most famous Filipino restaurants, which remains the Philippines’ most popular and still stands today as one of Manila’s best known landmarks. Having grown up in a family that loves to cook and eat, Sita learned the rudiments of marketing and cooking as a young girl. She raised her 11 children through various food ventures: reviving her mother’s old canteen, peddling turon and kakanin in schools, selling fruits in her mini-store- on wheels. Such entrepreneurship enriched her culinary journey. But her lasting legacy in Philippine culinary history has its beginnings overseas. In her travels, she realized how difficult it was to prepare Filipino food away from home, without the traditional indigenous ingredients such as sampaloc (tamarind) and bayabas (guava) for sinigang. She made it her mission to make Filipino food more accessible anywhere in the world. That was how Mama Sita’s products came into being and her vision became reality. Mama Sita’s Centennial Edition of What Kids Should Know About Filipino Food is available at Mama Sita’s kiosk at Greenhills Bazaar.